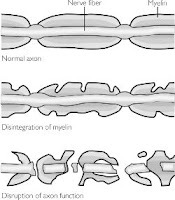 A demyelinating disease is any disease of the nervous system in which the myelin sheath of neurons is damaged. Myelin sheath is a covering just like an insulating layer on the electrical wires. This impairs the conduction of signals in the affected nerves, causing impairment in sensation, movement, cognition, or other functions depending on which nerves are involved, just like the naked electrical wires can cause generation of electric currents, shock and short circuit. The term demyelination describes the effect of the disease, rather than its cause. Some demyelinating diseases are caused by genetics, some by infectious agents, some by autoimmune reactions, and some by unknown factors. Organophosphates, a class of chemicals which are the active ingredients in commercial insecticides such as sheep dip, weed-killers, and flea treatment preparations for pets, etc., will also demyelinate nerves. Neuroleptics which are a group of drugs can also cause demyelination. Make 60 sachets of all these , mixed together in above mentioned quantity. Consume 1 sachet twice daily with Honey. Panchakarma is a group of ayurvedic therapeutic procedures which provide excellent result in nervious tissue disorders including demyelination diseases like Demyelinating Polyneuropathy – CIDP – Gullian Barre Syndrome and multiple sclerosis. These are all auto-immune disorders which are known in Ayurveda as Aam - vata. 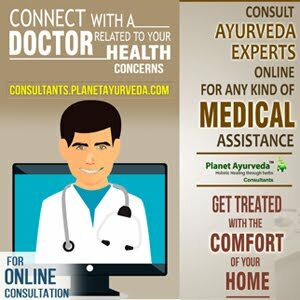 The Panchakarma procedures are the known as the best treatment for vata disorders and can give quick results if followed with the above mentioned ayurvedic treatement. sir i am suffering from cidp for last 11 years... i had 4 relapses in this period with complete remission with cortecosteroids treatments...now i am relapsing again..but i dont want to use steroids now because uing them i feel even worse than the disease itself...can i have ayurvedic treatment with success. my name is Padmavathi, I am 32 years old. I've suffered with "Demyelinating Cervical Myelitis" in August,2015. Admitted in hospital for 10 days after that I've have using medicine for 7 months. After that Doctor confirmed that it was completed cured. But from August,2016 again I feeling senseless in hands and automatically fingers are getting closed. Kindly suggest treatment and food guidelines. You can mail me at herbalremedies123@yahoo.com with reports and all the details. I'm suffering from Ponting desalination . My father is suffering from GBS, from past 4 months he is in hospital with ventilator support, can you please help me out for this.